A Great Great Aunt wrote down the family information years ago. 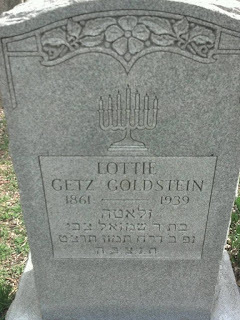 Selig Dudelczak, son of Samuel Harry (Schmuel Hersh) Dudelczak and Gertrude (Gitel) Slupsky, immigrated to America and changed his surname to Feinstein. He had two siblings who also immigrated, Julius and Tillie. We didn't have surnames for either one. Four siblings remained in Russia: Belle, Gershon, Selma, and Sprinsa. In my early research I confirmed all the information except for the four who remained. Julius changed his surname to Odelson, and moved to Chicago. Tillie had married an Aaron Oberman, and they remained in St. Louis. 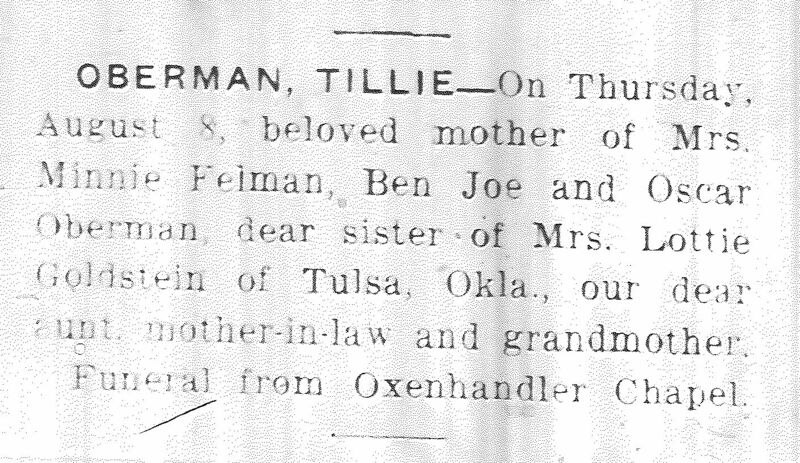 Recently I was going through the library microfilm of The Modern View (a St. Louis Jewish weekly newspaper), and I came across Tillie's 1935 obituary. 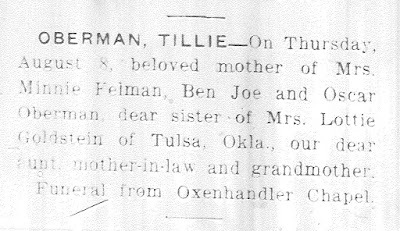 Oberman, Tillie - On Thursday, August 8, beloved mother of Mrs. Minnie Felman, Ben Joe and Oscar Oberman, dear sister of Mrs. Lottie Goldstein of Tulsa, Okla., our dear aunt, mother-in-law and grandmother. Funeral from Oxenhandler Chapel. My first thought was: This has to be a sister-in-law. That happens often in obituaries - spousal siblings being described as 'brother' or 'sister.' Even if my great great aunt had been unaware of one of the other siblings immigrating, "Lottie" bore no resemblance to "Belle" "Selma" or "Sprinsa." She had been correct on the other names. "I bet this is a sister-in-law," I thought to myself. The tombstone on the left is at Chesed Shel Emeth. She is not far from her brother, Selig, and her sister, Tillie. 1) Lottie's parents, according to her death certificate. The informant was her son, Sam Getz. 2) Sam Getz's parents according to his death certificate. The informant was the nursing home. 3) Sarah Getz Goodman's parents, according to her registration for Social Security. It appears that Lottie (like her sister) never changed her 'maiden' name. Both sisters were married in Russia, and their father appears with a variant spelling of the Dudelczak surname on their death certificates. However, both of Lottie's children, at some point, changed Lottie's maiden name in their minds, choosing between the two different surnames their uncles had chosen. Proving that they at least were aware of them. In a fashion, these documents provide a nice wraparound, incorporating all of the surnames.